Thank you to Jim Efaw for keeping us up-to-date and in the loop of the democratic events around Woodford County. As you all probably know, Woodford County is dominated by the Republican party and the Democrats are trying very hard to flip as many occupied seats as possible. Here are some events and article about what is happening and how you can become involved. 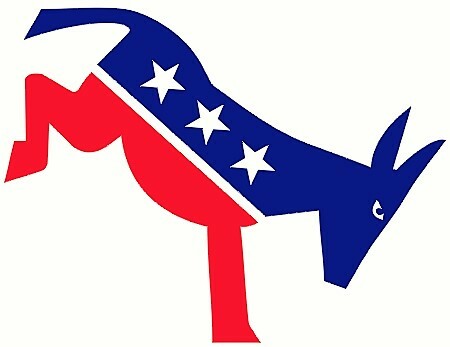 The other "What Happened": Doug Day, a regular at our meetings, pointed out the following article: "What Killed the Democratic Party?" by William Greider in The Nation: https://www.thenation.com/article/what-killed-the-democratic-party/ That article, in turn,is about a 34-page report called "Autopsy: The Democratic Party in Crisis" at https://democraticautopsy.org/ published by Action for a Progressive Future. It describes what has happened to the party in the last few years that has led to where we are now. The Affordable Care Act (Obamacare) enrollment period: started November 1. This isn't directly political: But the Republicans have intentionally cut advertising telling people that the enrollment period is open. It's going to be up to social services groups (which have no time because they're being starved by the Republican governor) and activists to tell the public this year. Bruce Rauner is looking unpopular: Even two Republicans are running against him. Thursday's WMBD News at 4 said that Republican Jeanne Ives' petitions had numbers transposed on her address, which means she has to start getting signatures again from scratch. The report comes from WMBD-TV's sister station WCIA in Champaign: http://www.illinoishomepage.net/news/capitol-news/republican-woman-joins-gubernatorial-race/847718562 (caveat for that site: WCIA and WMBD-TV websites also show planted headlines that look like news at the bottom, titled "Around the Web" instead of marking them as advertising.) Both of Rauner's opponents are pretty right-wing though. We'd like to have a notary public (or two) attend our Democratic meeting on the evening of Tuesday, November 14. We'll have a free taco bar and lots of friendly people, some of whom may want a notary there to witness their signatures. If you are a notary or know someone who is, please let us know as soon as possible. Tuesday, November 14, 6:30pm free meal, 7pm business, El Paso Community Center, South Pointe Park, 523 S. Sycamore St., El Paso IL 61738 — turn south to park at 5th & Sycamore. Our own Woodford County Democrats meet and eat. Wherever you're from, you're invited — no Democratic "membership" required! We'll be finishing up and collecting any candidate petitions you still have lying around and will get them to the right campaigns. We hope to have a notary public there in case you still need your petition notarized. We'll also be taking suggestions from you on what we should be asking the candidates about. Meet more real, live Democrats in person - and have a say in what really goes on in Democratic politics! Free tacos and nacho bar and drinks provided by El Paso city council member Sarah Steffen. More on the calendar: Kat Modisette (see Washington progressives above) was nice enough to provide her live calendar of Peoria-area progressive events. We now have it on our website at https://www.wcdem.org/calendar - you can then click on "Calendars: more Democratic & civic events" and see both Woodford Democrats and Peoria progressive events. We're still doing petitions: This weekend was stormy, but some of our people will be out next week and next weekend (November 11-12). If you'd like to join us, e-mail me - secy@wcdem.org - and we'll get you a location you like, or you can just pass petitions among family/friends/co-workers whenever you like the next two weeks. Every signature counts - even your own - so don't be shy about downloading some blanks from us.